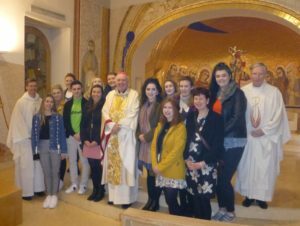 On Thursday 22nd February 2018 students from the Faculty of Education at Mary Immaculate College, Limerick, joined the College community for Mass. Our celebrant that evening happened to be Bishop Brendan Leahy of the Diocese of Limerick, whom the students know well. The students are pictured here together with Bishop Leahy, Fr Paul Finnerty from the Diocese of Limerick and the Vice-Rector of the Irish College, Fr Tom Norris, our Spiritual Director, and Dr Patricia Kieran, Lecturer in Religious Education at Mary Immaculate College.